Pyongyang - Arrival. Hotel. 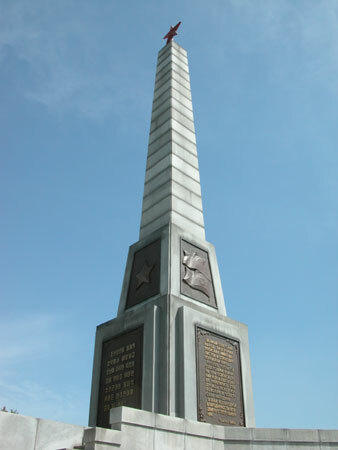 Monument to Soviet soldiers. Views from Moran Hill. 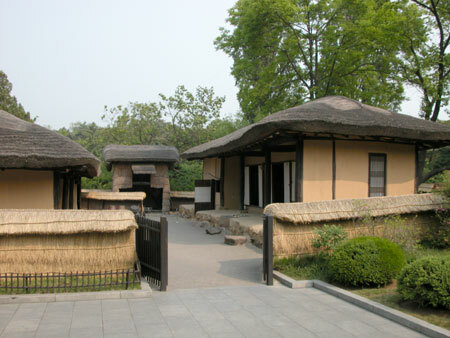 Birth place of Kim Il-song. 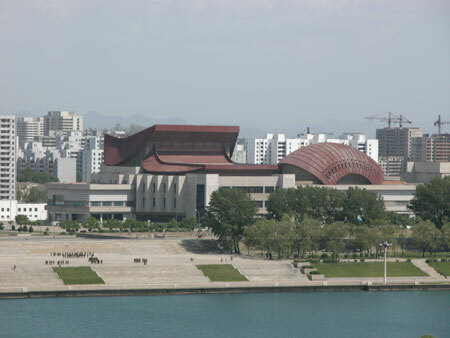 This time you will get acquainted with scarcely researched country of North Korea (DPRK - Democratic People's Republic of Korea). Recall that DPRK is a socialist country since the 1940s (not in the Lenin/Marxist understanding, of course, but in that of the USSR in the late 1980s) with all its pros and cons. The country is lead by Kim Chong-il and the North Korean Labor Party. The idea of going there struck me after watching a TV news broadcast in the spirit of "starving people behind barbed wire." However, the view of a modern city shown simultaneously leads me to believe that the text of the report didn't fully reflect reality. I searched the Internet and discovered feedback articles and replies from people who have visited North Korea. These replies were quite controversial, too. So I decided that it is better to see once than to hear a hundred times, and I readily found out that I could visit North Korea as a mere tourist. I selected the most comprehensive tour lasting about one week (if I fly all the way there, I have to see as much as possible). There several flight routes available: train to Moscow, flight from Sheremetyevo to Vladivostok, Khabarovsk, or Beijing. My choice was the flight Moscow-Vladivostok ("Aeroflot"'s Airbus A-310, 8 hours non-stop). From Vladivostok I flew in with the Korean company "Air Koryo" (Tupolev 134, one hour with change). To say that the group of Russian tourists was small is not to say anything. There were two of us: myself and Alexey Novikovsky from Obninsk (near Moscow). As it turned out, Alexey has once upon a time graduated from the Oriental Department of Leningrad State University, so I received a great deal of useful information from him (in the following albums his pictures will be used among others; they can be distinguished by color quality and file names). Staffed in this manner - with a farewell remark from Russian border guards "What the hell did you leave there!?" 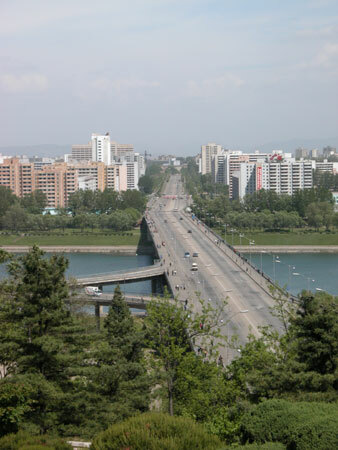 - with some anxiety, in one hour we were leaving the airplane in Pyongyang - the Capital of North Korea. It is indicative that there were no Europeans on board, only Koreans several Japanese. Border guards/customs officers were awaiting us in the airport. There were usual metal detectors and x-ray machines, no special questions, everything done properly. No one was interested at the site of a cell phone or a digital camera. 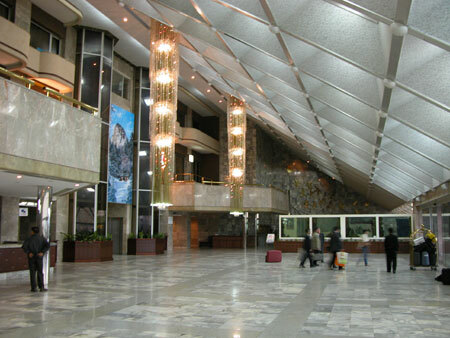 After a brief delay - border guards were looking for our "Ryohaengsa" representatives (this is the chief state tour agency of North Korea, analogous to the Soviet "Intourist") - we picked up our luggage and left the airport. 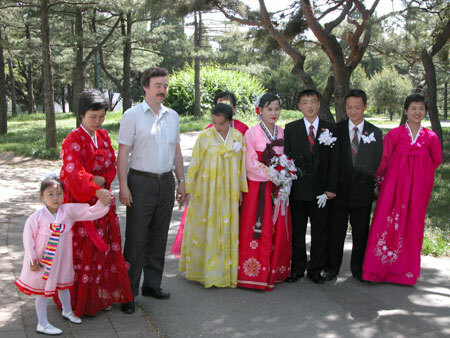 Evidently for the duration of our stay in North Korea we received a van, a driver, and two ladies (hereafter "our ladies" :)) as translators and attendants. It was growing dark, so we were driven straight to hotel Yangakdo (4*). The hotel impressed very much: 47 stories, 6 or 8 fast elevators (among those 4 with a transparent wall towards the street). The finish of the hall is quite interesting, as well (in the picture). 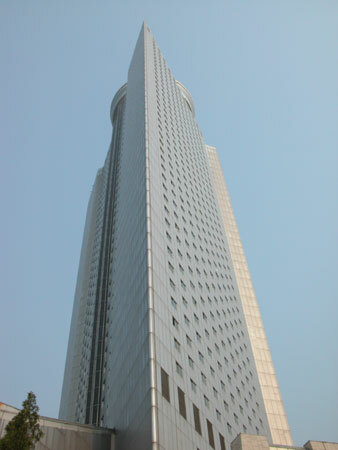 The building was completed in 1995. On the lower right is an aquarium with sturgeons, turtles and other animals. Room keys are plastic cards. There is satellite TV in the room (ours, for two, was on the 39th floor); everything the way it should be. Foreign tourists are treated like in the USSR - all the best for them (i.e. in this case for us:) ). When we woke up this was the foggy view from the window. As it turns out, this happens every morning, and then the fog lifts. Apparently, that's what their climate is like. Before breakfast we took a walk around the hotel. 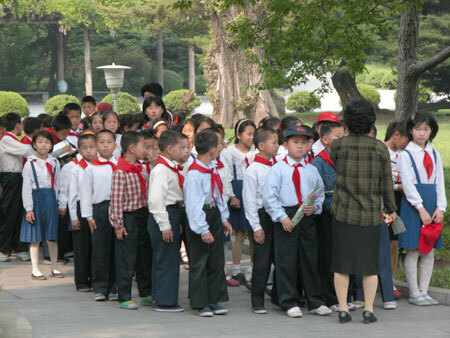 I will point out that in DPRK foreigners are not welcome walk around the city without attendants. However, no one was holding us by the hand, a liberty we used sometimes (described below). Probably for the reasons mentioned above the hotel is situated on a small island almost in the center of the city, and it has all commodities tourists need: several restaurants; souvenir, book, and other stores; in addition to a gymnasium, movie theater, and a stadium (the latter two, apparently, were used for conducting international festivals and other events in Pyongyang). 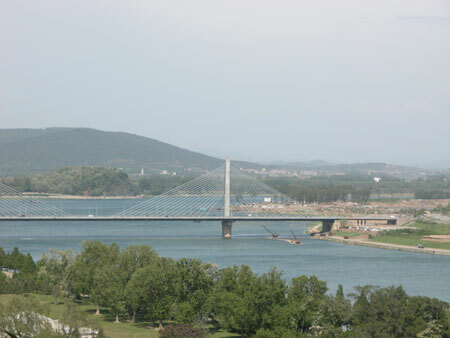 The bridge is connected to the mainland by a bridge (unguarded). General approach for casual tourist consists of the following: sleep over at the hotel, have breakfast their, go downstairs, and take the van to see the city, monuments or something else. Then have lunch somewhere (or return to the hotel for that), then again descend and drive, etc. Enough said for the introduction, we now go to the gist of the question:) First, I will show the city more or less in order, both the points of interest and regular streets; then we will visit other places in the country. 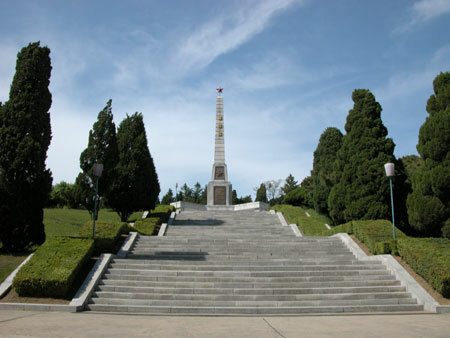 The first sight is this monument and park on Moran Hill. This is a monument to Soviet soldiers. "The great Soviet people smashed Japanese imperialists and freed the Korean people. Blood spilt by the Soviet soldiers during Korea's liberation strengthened bonds of friendship between Korean and Soviet people. This monument is erected as a sign of national gratitude. It is appropriate to note that the attitude towards Russians in DPRK is very good. They remark, however, that very few Russians came in the past years. The keeper of this monument was also glad to see us. We asked how long he had worked at this monument. Thirty years, he said (he looks like he is 60). On the contrary, the attitude towards Americans and Japanese is bad, and justly so. During the war (1950-1953) American almost leveled the ground with their bombings. Almost no historic buildings and monuments remained (not speaking of human losses). 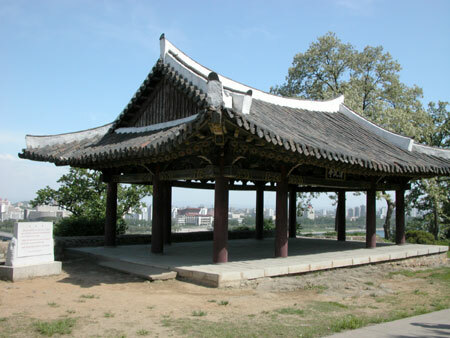 Accordingly, in South Korea (supported by the Americans) many buildings were preserved. Nowadays, the US won't let Korea complete its Nuclear power plant and declared it the "axis of evil." Keep in mind that their is a constant energy deficit in the country, and no oil or natural gas. Earlier USSR, probably, supplied fuel at lower prices, but Russia doesn't do it any more. Speaking of Japan, it has old problems and disputes with Korea - century-old, as far as I could tell. Until 1945 Korea was occupied by Japan. Europeans are treated decently. It suffices to say that prices are indicated exclusively in euros (as well as in the local currency) even though dollars are also accepted. 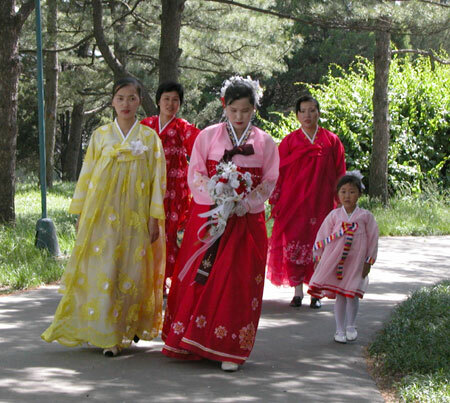 Korean wedding near the monument (by far not the only one we saw). Another wedding not too far away in the park. Alexey is on the left. There are many parks in the city and they are quite big. A photograph album I bought in Pyongyang is called precisely that - "Pyongyang - the City of Parks." The two things that probably had such an impact are that after the war the city was built anew and that because of lack of private ownership of land there was no chaotic or high density construction and all streets, avenues, and parks were built purposefully. 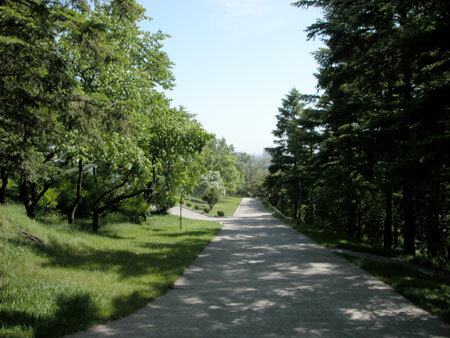 The landscape is conducive to that; there are several big hills in Pyongyang. There is little or no industry in the city - just a chimney of a heating facility is sticking out. Now several views from Moran Hill. 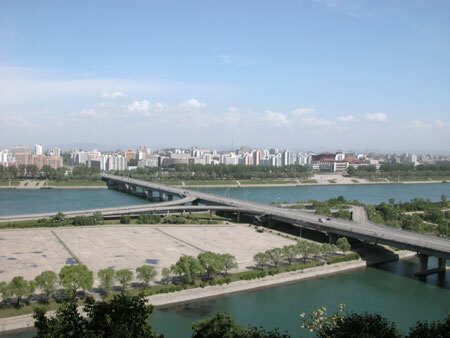 Two rivers flow through Pyongyang - Taedong (on this photo and on the others) and Potong. I apologize in advance for not saying Korean names of places. First, they are very difficult to remember, and, second, to give a meaningful transliteration from English spelling to Russian is not always trivial. Holds 150 thousand people. Opened in 1989. 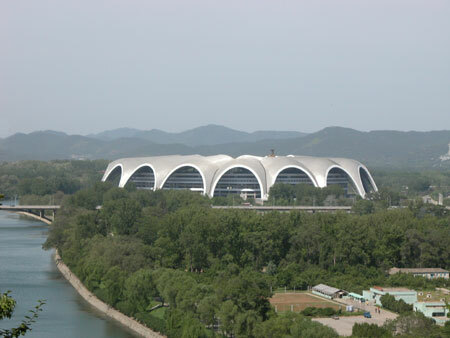 Opening and closing ceremonies of the 13th International Youth Festival took place here. It is interesting that it is not typical to mention in books names people who engineered buildings. It is pictured on bottle caps of a beer brand, of which there are quite a few, by the way. I am not a beer connoisseur; I can only say it tasted good. A connoisseur whom a brought a bottle confirmed this:). One can frequently see small vessels that either clean the bottom of the river or extracting sand. 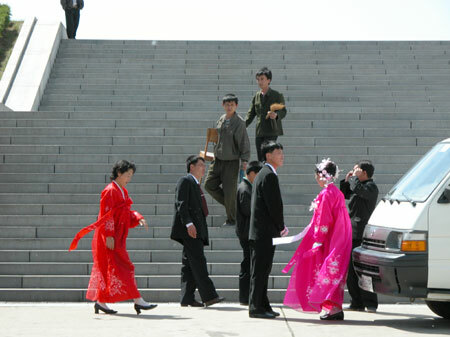 In this album we will see one more sight - the birth place of Kim Il-song. I think it is worth explaining who Kim Il-song is. For Koreans he signifies roughly what Lenin signified for us. 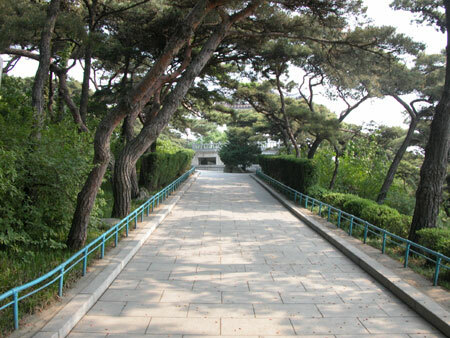 That is, a revolutionary, who laid the foundation for a new state; he is no more (his son - Kim Chong-il - is the head of state) and there are many monuments and memorable places connected to him. However, there are several differences. First, in his views Kim Il-song was more an admirer of Stalin that of Lenin. Second, Korea is a much more oriental country than Russia and the status of the head of state is much "holier" here. For example, the official chronology in DPRK begins with 1912, the year of birth of Kim Il-song. They write, for example: "year of Jujche 93 (2004)." Nevertheless, the people take this rather indifferently without visible fanaticism. 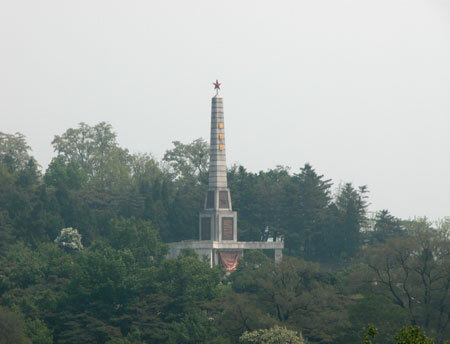 So, the birth place of Kim Il-song. They stipulate that he was born in this house and lived here. In reality it is probably not so: for example, there are no signs of a heating system (winters in DPRK are quite cold, even with snow), etc. In brief, this should be treated as a monument and not as a real house. 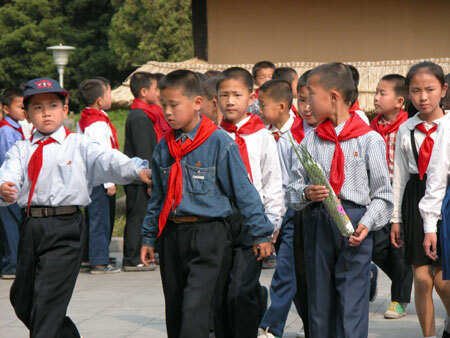 Tour guides stress that Kim Il-song lived in poverty (it is emphasized by tools placed in the house and in the courtyard). The flow of visitors is almost incessant and consists of tourists, pioneers, and soldiers. Most are in groups. It is interesting that while some school dress code definitely exists, not all students abide by it (which, given Koreans' discipline, is rather odd). Also, it had been pointed out to me that pioneer ties here are tied differently from the Soviet way. And indeed they are:). I will add that there is no analog for octobrists in Korea. That is, pioneers are followed by the komsomol, which is followed by the Party (selectively). School education is mixed (boys and girls together) and lasts ten years. All education (grade school and higher education) is free as well as all extracurricular activities. Same goes for health care (drugs are rather expensive, however). I have personally seen how children in buses are driven to the zoo, to concerts, etc. A group of servicemen followed the pioneers. So, I'll say a few words about it. The service lasts 6 years. Women can serve, as far as I understood, but for them it is not obligatory. Interestingly, all construction in the country is done by the army. As we can tell from the results, it is done rather well. 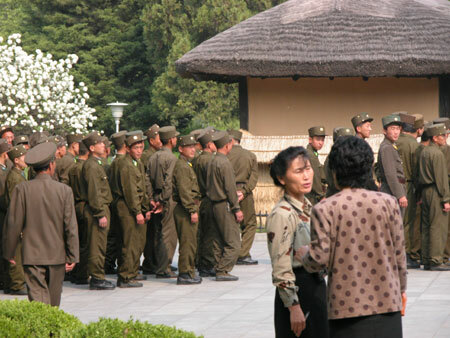 From the point of view of an exterior observer it may seem that DPRK is a very militarized country. There are soldiers anywhere you look. No one can tell that they are just builders:). By the way, vehicles owned by the military have black license plates and a white number (civilian vehicles - white background with a black number and letters to designate the city). The uniform greatly resembles the Soviet one. 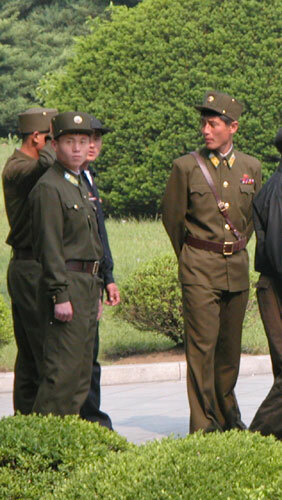 Here it doesn't stand out, but on the border with South Korea where we went the uniform is very similar. Quite often we spot soldiers with medals. We were told that for the most part they were awarded due to incidents on the border with South Korea. At the end of the first album I would like to remind you that went on a tour, and not on a journalist mission or a reconnaissance:). So I ask you to treat information and photos presented here indulgently in the sense of accuracy of the former and quality and choice of points of view of the latter. I barely had any time to shoot decent pictures. Meanwhile see the next album, on Pyongyang subway.